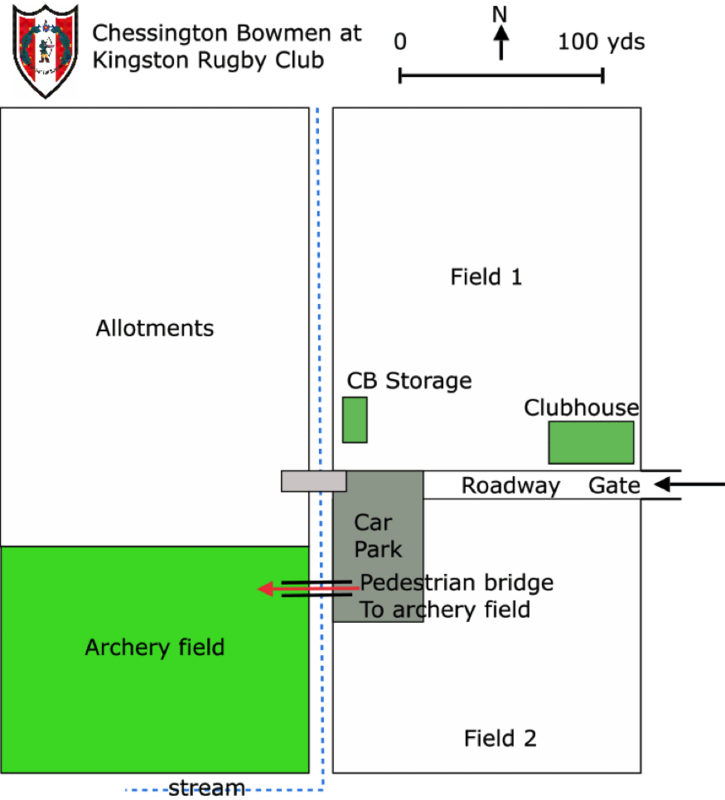 We shoot in a large field at Kingston Rugby Club, just off the Hook Road in Chessington, behind King Edward's Recreation Ground. This a private site and allows us the freedom to shoot up to 100 yards all year round. 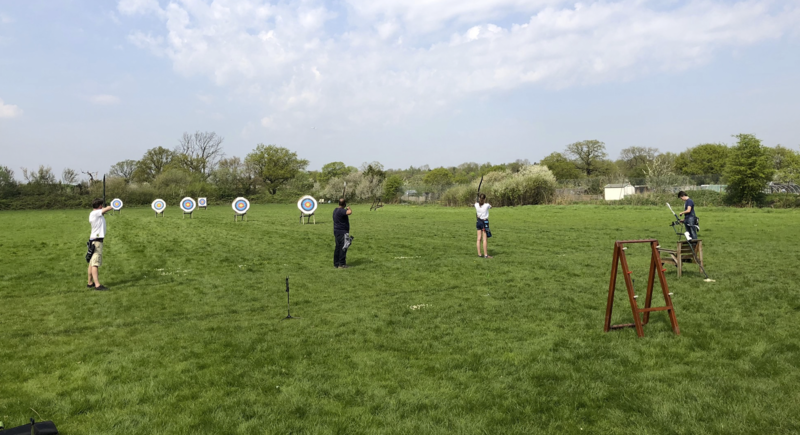 In the summer we often shoot full distance rounds of 144 arrows such as a York round or a World Archery 1440 round starting at 90m. 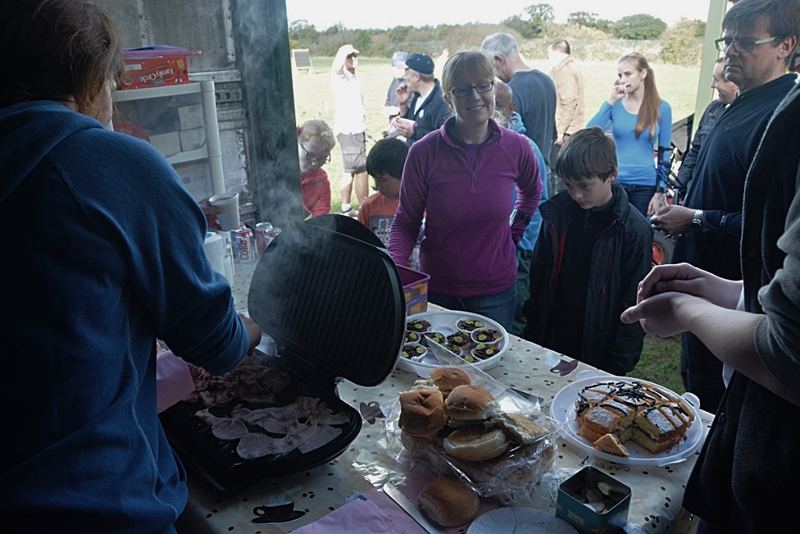 Not just archery, on Saturday mornings we serve bacon butties, sausage baps, cakes and hot drinks all year round. 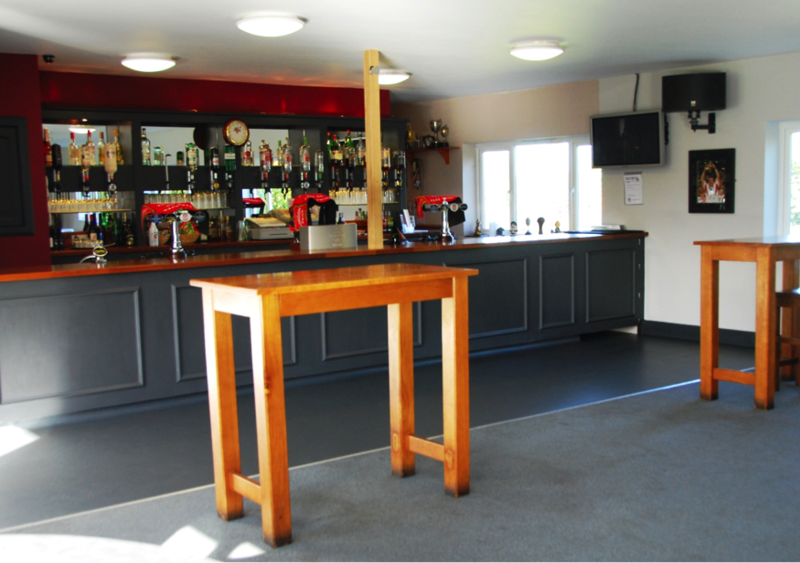 For social functions, such as the AGM and our Christmas party we use the fantastic bar at Kingston Rugby Club. BY ROAD From M25: Junction 9, exit for Kingston / Leatherhead. Follow signs for A243 (north) towards Kingston and Chessington World of Adventure for 4 miles. The turn-off for the club is immediately before a park, about 150m after a small petrol station on the left and 300m before the Ace of Spades roundabout (A3). 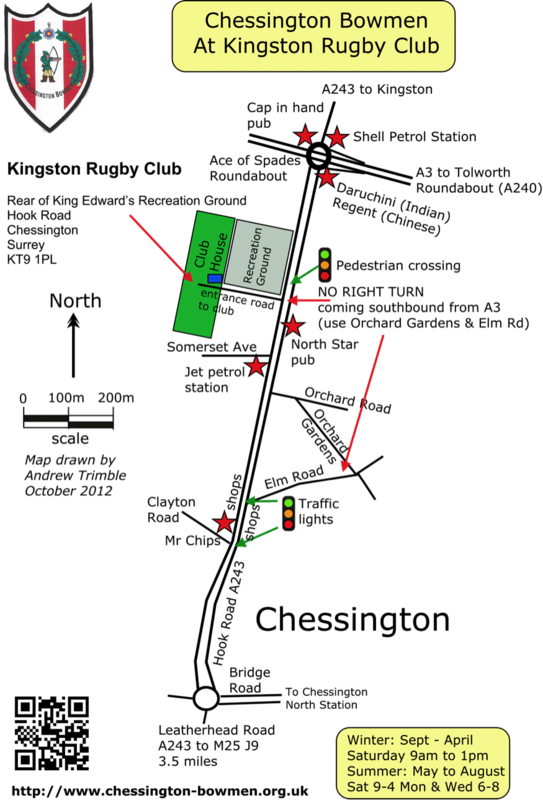 There is a sign for Kingston Rugby Club on the corner of the park. Turn left into the narrow (unamed) road, and drive 200m down to the club gates at the end. Come through the gates. The club house is on the right. There are a few parking spaces on the right in front of the club house but a bigger car park on the left a little further along the drive, the archery field is on the right. From London (A3): Come off A3 at the Ace of Spades roundabout, Coming southbound it is not possible to turn right into the entrance to the club because of the dual-carriageway. Instead keep going south for about 500 yards from the roundabout. Turn left into Orchard Gardens about 100 yds after the North Star Pub, follow the bend in Orchard Gardens round to the right, then right into Elm Road (see map below). Turn right at the traffic lights onto Hook Road heading back northbound towards the Ace of Spades. The turning for the club is on the left after about 300 yds. See further details above. BY RAIL: From Waterloo to Chessington North Station (on Chessington South line). Turn right out of the station and follow Bridge Road to a roundabout. Turn right and follow Hook Road towards the Ace of Spades roundabout for about 1 mile. See details above.